To be the successful job candidate in the technology field, it helps to have a comprehensive resume. 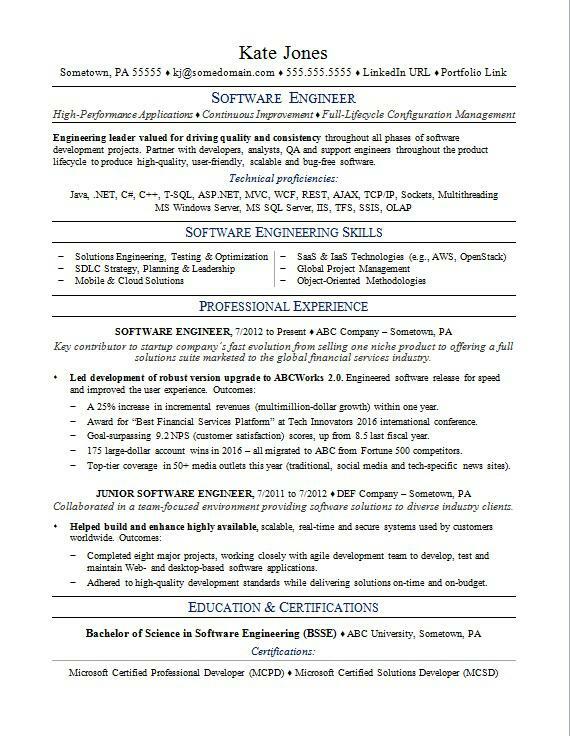 To see if your own resume could use some reprogramming, view our sample resume for a software engineer below and download the software engineer resume template in Word. Jobs for software engineers are projected to grow by 24% (or 302,500 jobs) from 2016 through 2026, which is much faster than average, according to the Bureau of Labor Statistics (BLS). You'll find the highest level of employment for this job (systems software) in the following states: California, Massachusetts, Texas, Virginia, and New York; and in the following metropolitan areas: San Jose, CA; Washington D.C.; Boston; New York City; and Los Angeles. As a software engineer, you can expect to earn a median wage of $103,560 per year, or $49.79 per hour, according to the BLS. Additionally, you can search for software engineer jobs and learn more about technology careers on Monster. Engineering leader valued for driving quality and consistency throughout all phases of software development projects. Partner with developers, analysts, QA and support engineers throughout the product lifecycle to produce high-quality, user-friendly, scalable and bug-free software. Key contributor to startup company’s fast evolution from selling one niche product to offering a full solutions suite marketed to the global financial services industry. A 25% increase in incremental revenues (multimillion-dollar growth) within one year. Award for “Best Financial Services Platform” at Tech Innovators 2016 international conference. Goal-surpassing 9.2 NPS (customer satisfaction) scores, up from 8.5 last fiscal year. 175 large-dollar account wins in 2016 – all migrated to ABC from Fortune 500 competitors. Top-tier coverage in 50+ media outlets this year (traditional, social media and tech-specific news sites). Collaborated in a team-focused environment providing software solutions to diverse industry clients. Completed eight major projects, working closely with agile development team to develop, test and maintain Web- and desktop-based software applications. Adhered to high-quality development standards while delivering solutions on-time and on-budget. You may be a genius when it comes to writing code and designing software, but you'll need to rely on a different set of skills to write your resume. After all, in order to have the best shot at getting called for a job interview, your resume needs to shine right off the bat. Could you use a little help making sure it's ready to be seen by hiring managers? Get a free resume evaluation from the experts at Monster's Resume Writing Service. You'll get detailed feedback in two business days, including a review of your resume's appearance and content, and a prediction of a recruiter's first impression. Think of it as your resume, version 2.0.